When it comes to repealing and replacing the Affordable Care Act, Democrats are from Venus while Republicans are spread out between Mars, Saturn, and Pluto. Members of the two parties held dueling media events this week portraying the healthcare law from the perspective of entirely different planets, with the Democrats arguing it's saved countless lives and the Republicans calling it a “disaster” for the American people. At a Heritage Foundation event Wednesday, conservative House Republicans said they would start presenting their ideas for dismantling the law through an expedited budget reconciliation bill that could pass on a straight party-line vote. They and Sen. Mike Lee, a conservative stalwart, argued for pushing ahead on rapid repeal without waiting for a full replacement package, an approach that alarms healthcare industry groups. The Republicans at the event also favored abolishing all the taxes that pay for the ACA's coverage expansions, a position at odds with more moderate Republicans worried about how to pay for replacement coverage. House Speaker Paul Ryan says he's sticking to his timetable to pass the repeal bill before the Easter recess in early April. The House leadership's and Trump administration's reported strategy is to include in the reconciliation bill significant replacement features, such as premium tax credits that are more modest than the ACA's; state high-risk pools for people with pre-existing conditions; expanded health savings accounts; and Medicaid changes, perhaps including turning Medicaid into a program of capped federal payments to the states. Democrats were preparing for full resistance. House Democratic leaders held a pro-ACA event in the Capitol Tuesday introducing a number of parents and children from around the country who have benefited from the ACA's coverage expansions and protection from insurance discrimination based on preexisting medical conditions. One parent, Amy Krohn of Columbus, Ohio, told how she couldn't get insurance for her daughter, who suffers from Type 1 diabetes, after her husband lost his job and insurance in 2012 prior to the ACA's implementation. The ACA changed all that. House Democratic leader Nancy Pelosi and other top House Democrats at the event vowed they would only work with Republicans on changing the law if those changes expand and improve its coverage and patient protections. If Senate Democrats take the same position – and so far they have – that would leave Congress deadlocked, because Republicans will need at least eight Democratic votes in the Senate to pass an ACA replacement package. Healthcare lobbyists noted that Trump lunched at the White House Thursday with a number of Democratic senators from states he won, including Heidi Heitkamp of North Dakota, Jon Tester of Montana, Joe Donnelly of Indiana, and Joe Manchin of West Virginia. They wondered if the subject of healthcare came up. One unexpected development this week was the statement by Rep. Mark Meadows, chairman of the hard-right House Freedom Caucus, that he would be open to two major requests from insurers to help stabilize the individual insurance market – funding the ACA's cost-sharing reductions that insurers are required to offer lower-income enrollees, and restoring risk payments to insurers that sign up a disproportionate share of sicker members. He said he'd consider supporting these measures during a short-term transition away from Obamacare to a new conservative system. 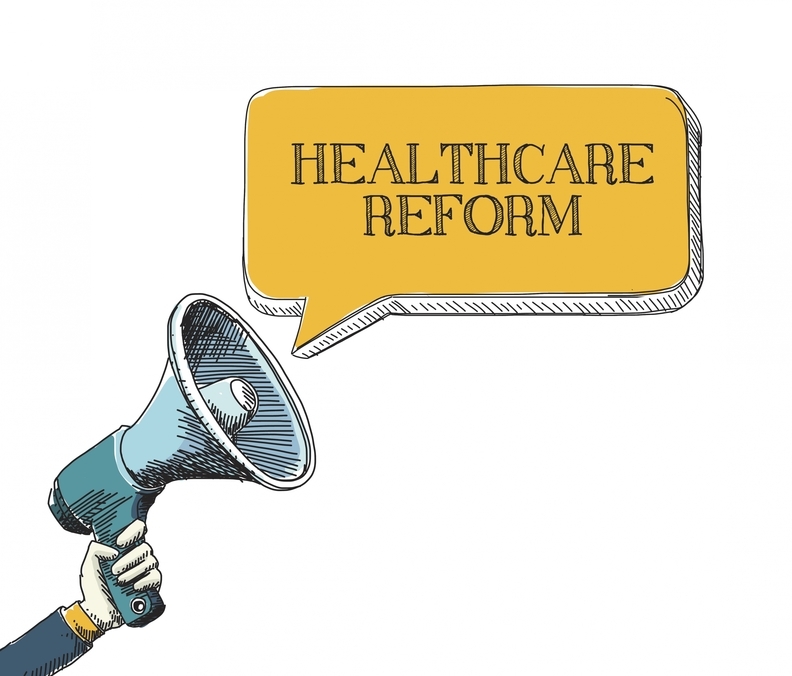 Providers and other healthcare stakeholders are particularly watching whether Republicans will include in their repeal bill a rollback of the ACA's Medicaid expansion and a conversion of Medicaid to state block grants or per-capita grants. They are nervous because that almost certainly would mean a big cut in federal Medicaid funding and a big rollback in coverage, leading to a spike in uncompensated care. Rep. Steny Hoyer, the second-ranking House Democrat, said if the Republicans tried to pass Medicaid restructuring through a budget reconciliation bill, there's not much Democrats could do to stop it. But they will face powerful resistance, he predicted, from Republican governors in states that have expanded Medicaid that would dissuade Senate Republicans from backing major Medicaid cutbacks. James Capretta, a prominent conservative health policy expert, doubted that congressional Republicans could quickly push through a hugely controversial restructuring of Medicaid without taking more time to craft a political compromise with the states and other powerful stakeholders.